Top winter hikes near Montreal? Take your pick. With one mountain range southeast of Montreal and yet another northwest, the city is surrounded by acres of forest, ski resorts, lakes, and assorted waterways. Throw in a layer of snow and you've got yourself a winter hiker's dream. You don't even have to leave the city to spend a day hiking winter trails. Head to Montreal's Mount Royal Park and rent a pair of snowshoes or cross-country skis to explore its trails and the city from every direction. Leashed dogs are allowed on the premises. To learn more about Montreal and Mount Royal's flora and fauna as well as discover the best vantage points on the mountain, book an evening snowshoe excursion. Conclude activities with a leisurely skate on Beaver Lake's refrigerated rink and then head down to trendy Mile End and Plateau neighborhoods—Mount Royal borders them—for a night on the town. Explore 1,510 square kilometres (938 square feet) of protected land by the highest resort peak in the Laurentians at Mont Tremblant National Park's more than 25km (16 miles) of winter trails, 5km (3 miles) of which are specifically groomed for winter hiking. Dog sledding, cross-country skiing, fat biking, and other winter sports are part of the experience. A small admission fee applies outside of rental fees for access to the provincial park's grounds. A recent innovation offered free of charge, special wheelchair-adapted Ski-Vel equipment allows visitors with mobility issues to enjoy the trails. Mont Tremblant also happens to feature Quebec's best known downhill ski destination. Make it a weekend getaway and hit the slopes while you're in the neighborhood and check out the resort's après-ski activities. Factor in a two-hour drive to reach Mont Tremblant from Montreal. 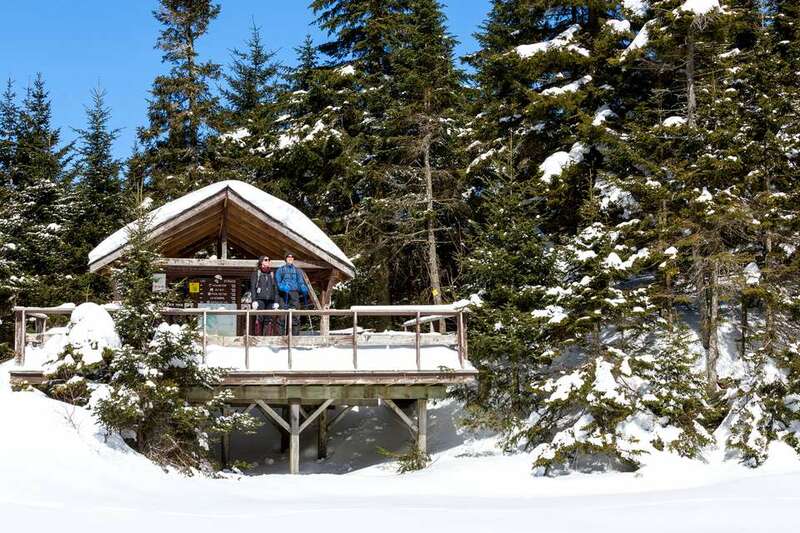 Located in the heart of the Eastern townships, Parc national du Mont Orford is a winter hiking haven with over 90km (56 miles) of loop trails of varying difficulty taking anywhere from 1 to 6 hours, depending on the selected route. With access to four summits, lake views, and elevations reaching 853 meters (2,799 feet), visitors brings their own equipment or rent cross-country skis, and snowshoes on-site. As with all provincial parks, a small admission fee is charged with or without equipment. For a memorable evening, book an evening torchlit snowshoe package lasting three hours that concludes with chocolate fondue around a fire. Guests with mobility issues can request free access to Ski-Vel, specialized equipment that adapts wheelchairs to handle snowy conditions available at select national parks throughout Quebec. Adjacent Parc du Mont Orford is alpine ski resort Mont Orford and some of the best downhill ski slopes in the province of Quebec, including challenging double diamond glades, about two hours from Montreal by car. Located northeast in the Quebec City region, visitors praise dog-friendly Vallée Bras du Nord. Its scenic valley and waterfalls frame one of Eastern Canada's best mountain biking destinations. Rent a fat bike and cottage nestled in the woods and spend the day exploring its over 20 km (12 miles) of beginner, intermediate, and expert fat bike trails. Or hike through 70 km (44 miles) of snowshoe trails. A modest admission fee applies. Vallée Bras du Nord is a little over a two-and-a-half-hour drive from Montreal and 45 minutes from Quebec City. For a light afternoon hike near Montreal, try Rougemont. It's a mountain 366 meters (1,201 feet) above sea level a 45-minute drive from Montreal in the heart of Montérégie, a small region neighboring the city in the southeast. Its best winter trail is a 3.6 km (2.2 miles) loop on the orchard-lined grounds of Cidrerie Michel Jodoin. For a tiny admission fee, expect to spend 1.5 hours exploring the area including the summit lookout. Dogs welcomed. Snap up assorted cider products at the cider producer's adjacent store. In the same Eastern Townships region as Mont Orford and a comparable two-hour drive from Montreal, serious winter hikers spend the day (or more) exploring the Parc d'environment naturel de Sutton's maximum elevation of 968 meters (3,176 feet) and the views its four summits afford—face south to peek across the border into the United States—of Vermont and its mountains. Count on 52 km (32 miles) of marked looped trails open year-round which, depending on the trail, take anywhere from two hours to up to two days to complete. Leashed dogs are allowed everywhere except on the Green Mountains Natural Reserve. Equipment rentals, including snowshoes, cross-country skis, and fatbikes, are available for use at a slightly different location, at nearby downhill resort Mont Sutton. Hikers can count on 17 km (11 miles) of walking trails of varying difficulty. Fat bikers are offered 10 km (6 miles) of trails, and cross-country skiers can explore close to 30 km (19 miles) of groomed and marked trails, most of them easy, but over 6 km (4 miles) are a worthwhile challenge for seasoned Nordic skiers. Admission and rentals only cover the resort's 150 acres of trails though, which are separate from the Parc d'Environment Naturel de Sutton's extensive network, which charges its own separate admission.